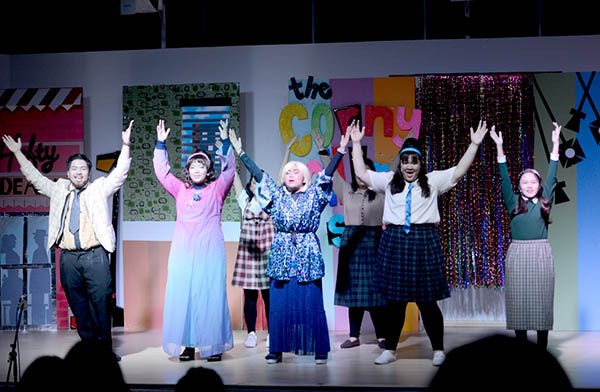 Audience members were dazzled as they were transported into the 60s during the matinee show of “The Corny Collins Show” (based on “Hairspray”). The show took place on Sunday, 9th of December at Dewan Auditorium, Bangunan Tambahan, Jabatan Penerangan, Airport Lama. 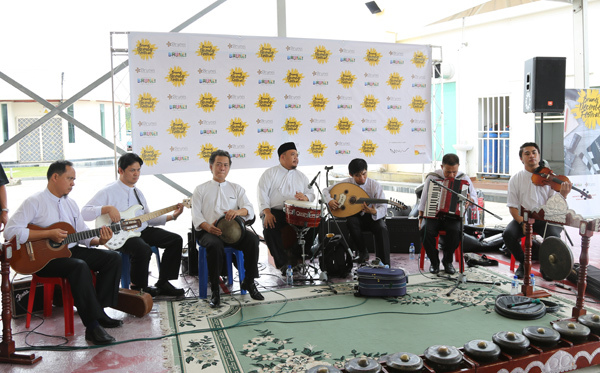 The production was part of Brunei December Festival, with the support of the Ministry of Primary Resources and Tourism. 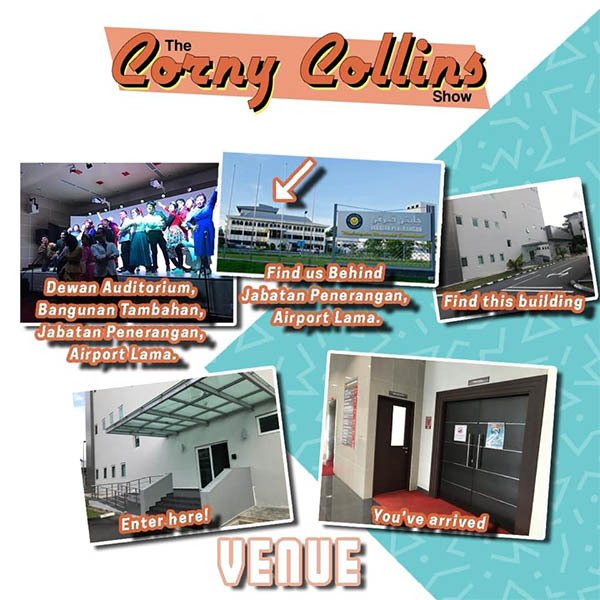 “The Corny Collins Show” was also supported by Jabatan Penerangan, Jabatan Perdana Menteri; D’Music Motion Fitness Studios, CfBT Education Services, Lailatul Shazana’s Production House and Selera Alam. 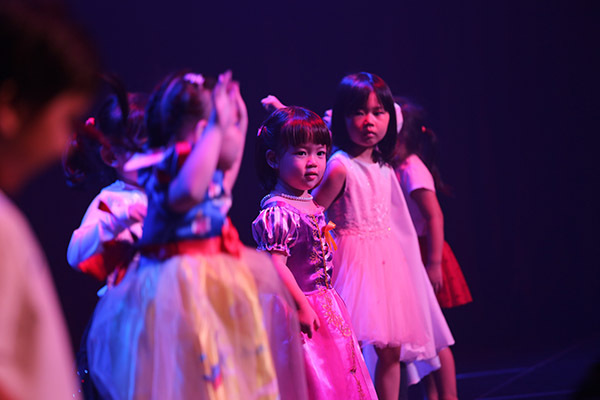 The production was the ninth production by Seeds Brunei following, Seuss!’ is based on the world of Dr. Seuss, “SEEDS Wicked Witch”, “SEEDS’ Willy Wonka”, “Into The Woods” and “Oliver! The Musical”. 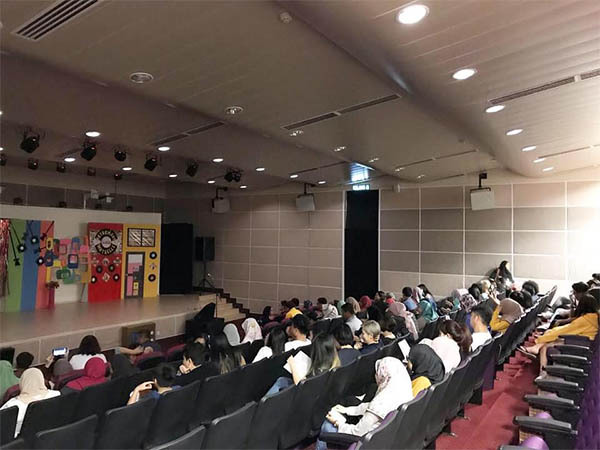 Seeds Brunei is recognised as an educational society led by volunteers with the support of the department of schools, Ministry of Education and uses theatre and other creative activities as an educational tool for students in secondary schools and higher institutions. 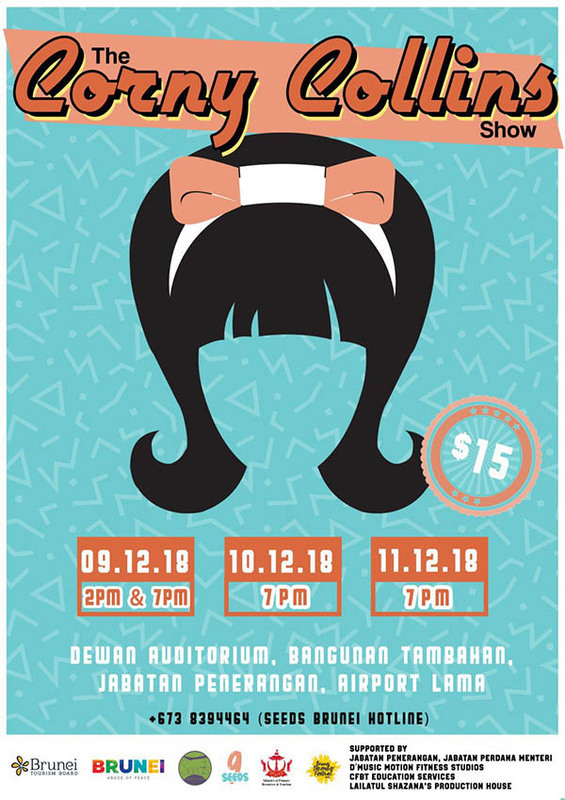 “The Corny Collins Show” tells the story of Tracy Turnblad, a big girl with big hair and an even bigger heart in the 60’s who is on a mission to follow her dreams. 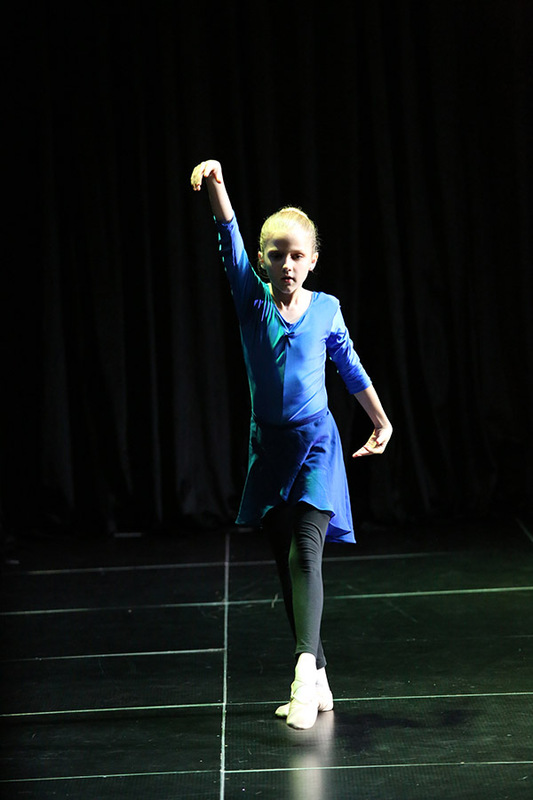 You can’t stop the beat as she sets out to dance her way onto national TV with the nicest kids in town. Tracy’s audition makes her a local star and soon she will be using her new-found fame to fight for equality, bagging local heart-throb Link Larkin along the way! 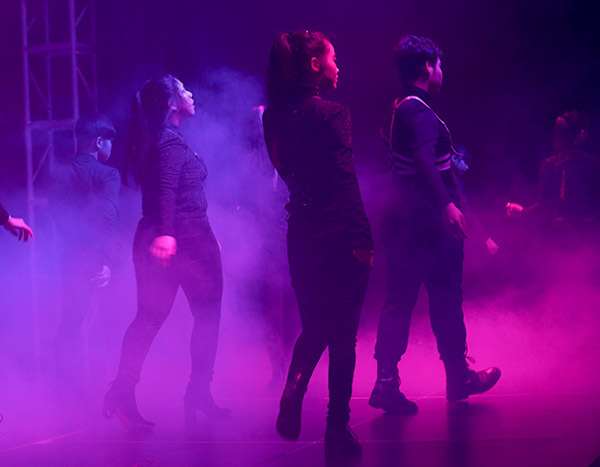 Over 70 students and graduate youths were involved in the production from stage managing, costume and prop designing as well as in lighting, music and sound. 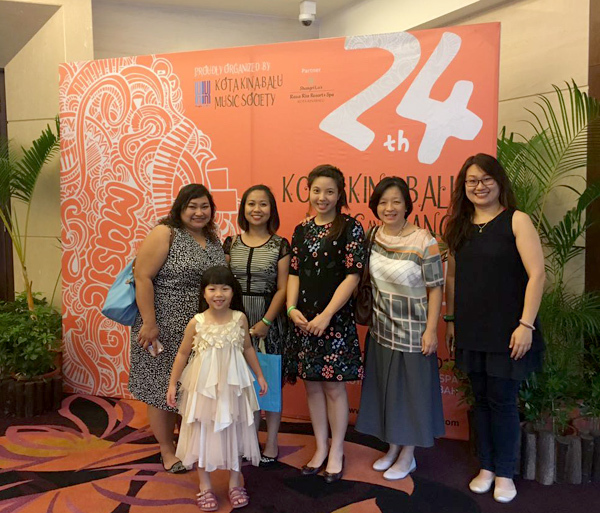 Teachers from various schools, local talents and volunteers were also involved with the production. 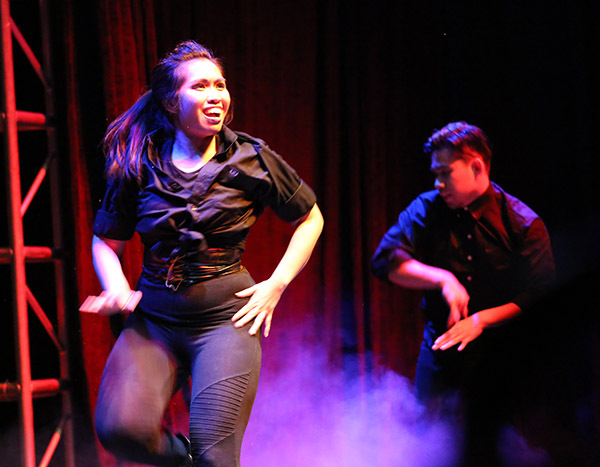 The performance was a year-long process by Seeds Brunei in a series of workshops which emphasises the holistic acquisition of all dramatic skills, from cast to stage direction and costuming. In March 2018, Seeds held #Seeds9Refresh hosted by Sekolah Menengah Katok registration. 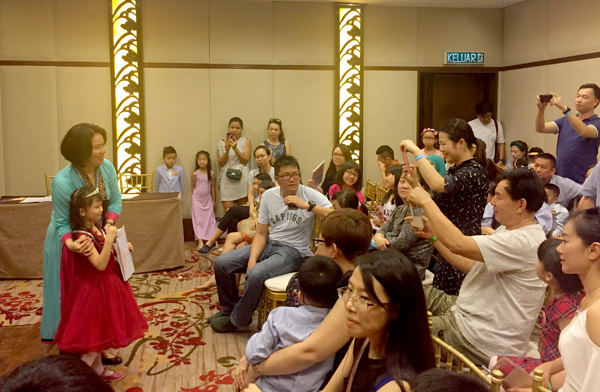 Various workshops at Sekolah Menengah Menglait Gadong in April and cast auditions at iCentre in May. 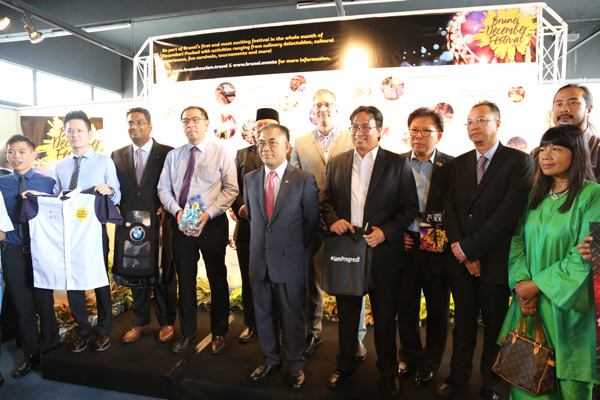 Seeds9 Mini-Showcase at Dewan Setia Pahlawan MPRT (Ministry of Primary Resources and Tourism was held in July 2018. This event was a preview and work-in-progress for what’s to come later this year. 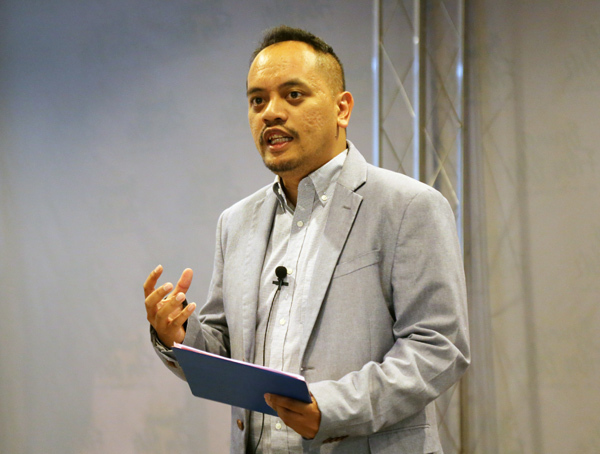 The final workshop in September 2018, Theatre Bootcamp, was held over the course of two days at Pusat Tingkatan Enam Sengkurong. 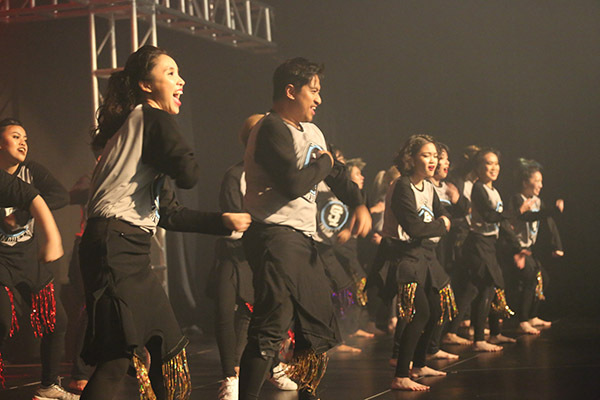 50 dancers, 6 instructors, 1 dream” — #justdancebn is made possible by the combined efforts of 50 local talents, 6 local instructors from @bruhooders @ringubaby @soulindustryco to bring Brunei’s dance scene to a whole new level. The crew and the team have been practicing for four months to make this event possible. The event took place at ISB Theatre Hall and it was a full house event then. I hope to see more of these events in the near future 😀 Thank you to @generation.z for the invitation and creating a memorable event for the performers and the audience. Have you visited Sound & Canvas lately? 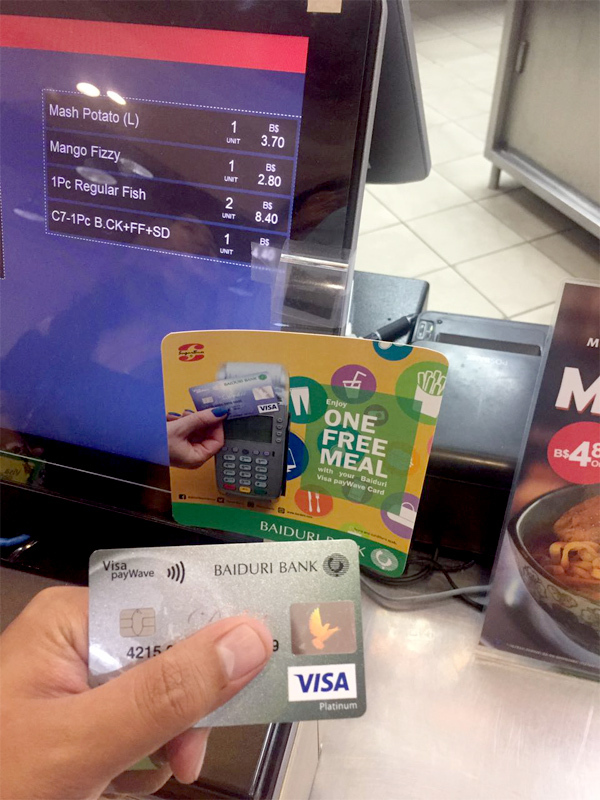 It was launched earlier recently at Setia Kenangan II, Kiulap, above Games & Latte. 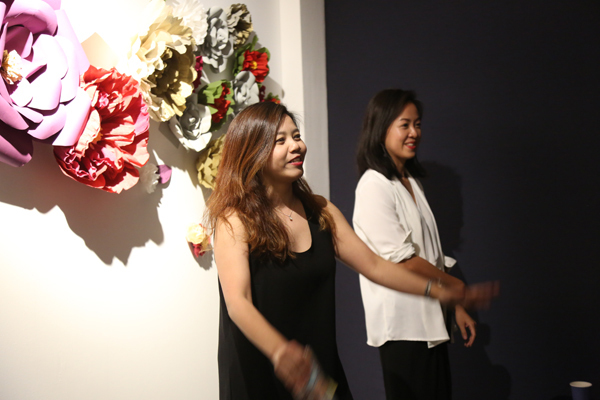 It’s managed by Sandy Tan who has the desire and passion for a creative community, devoted to experiment art in Brunei Darussalam. 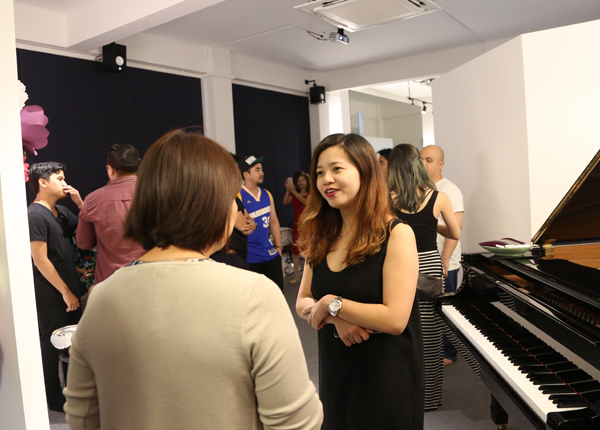 Her new studio aims at establishing creativity merging original music with various forms of arts. 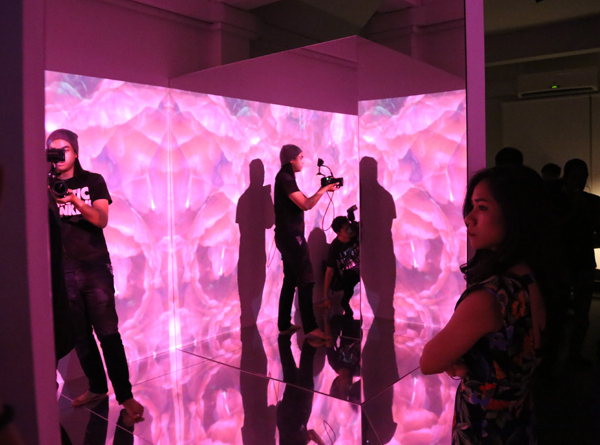 Sound & Canvas (@soundncanvas) collaborated with Other Half Studio (@otherhalfstudio) for the theme “Can you keep a secret?”, an immersive Audio-Visual Exhibit. 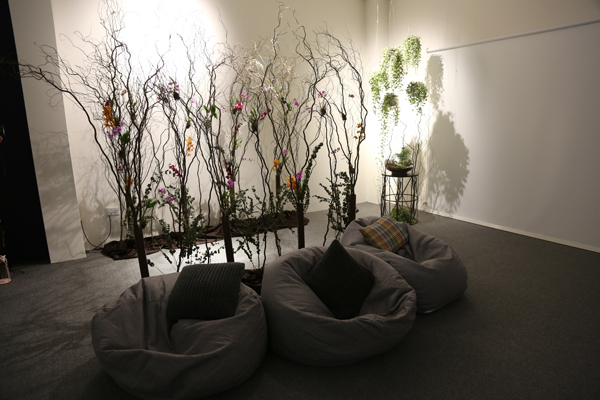 It is also supported by @happypetalsnco, Bloom Project Co. (@bloomprojectco) and Piccolo Cafe (@piccolocafebn). 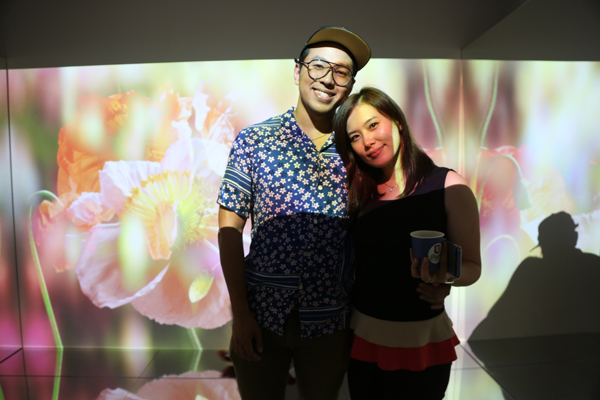 The Audio-Visual Exhibit will be ongoing until 31st December and it opens from Thursday to Sunday from 7:30pm to 11:00pm. There is section of beautifully crafted paper petals on the wall where guests can write and post their comments or love notes for Sandy and her new studio. 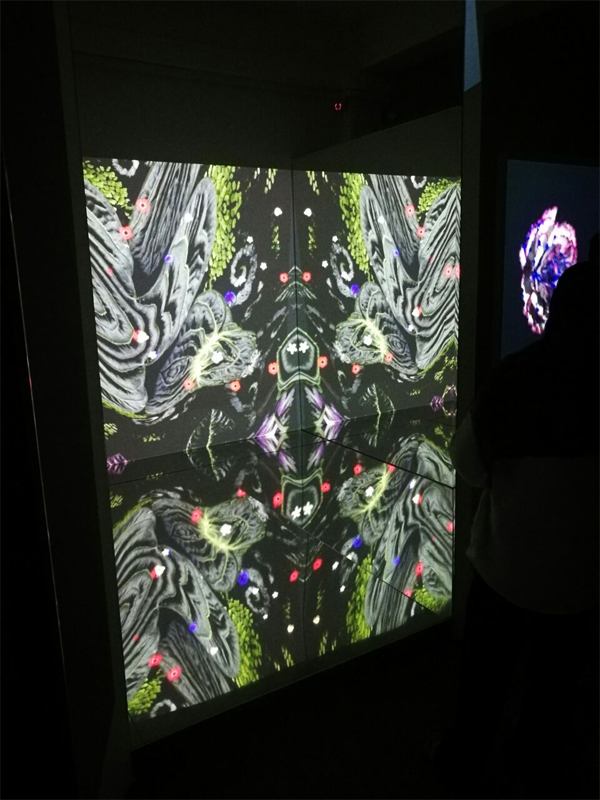 So far the response has been encouraging and it was good to see the youth turning up for the Audio-Visual Exhibit and beginning to appreciate the artistic value of creative arts merging with original music. 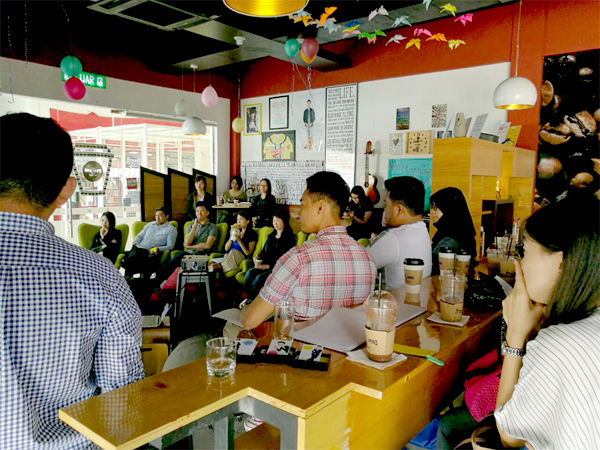 This could be a new space for local artists and musicians to work together in promoting arts and music in Brunei Darussalam. 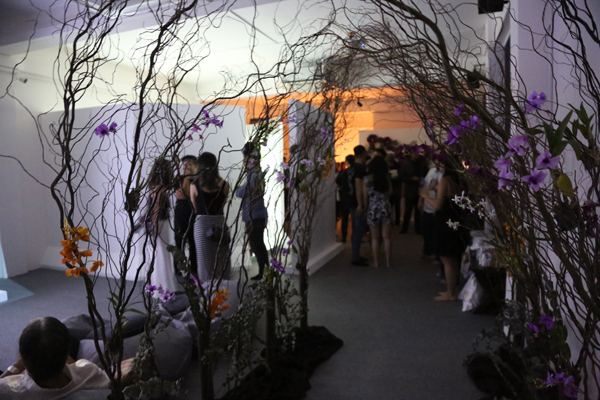 Hence the space will be continually reconfigured throughout the year to host various exhibits and showcases. In terms of services, Sound & Canvas provides advertising soundtracks, film/short film/tv/podcast soundtrack (that caught my eye huhu) and sounds/music for apps and games. At Sound & Canvas, Sandy hopes to connect with musicians, artists, performers and independent makers who share a passion for creating original, ambitious work. She holds BA of Communications (Hons.) 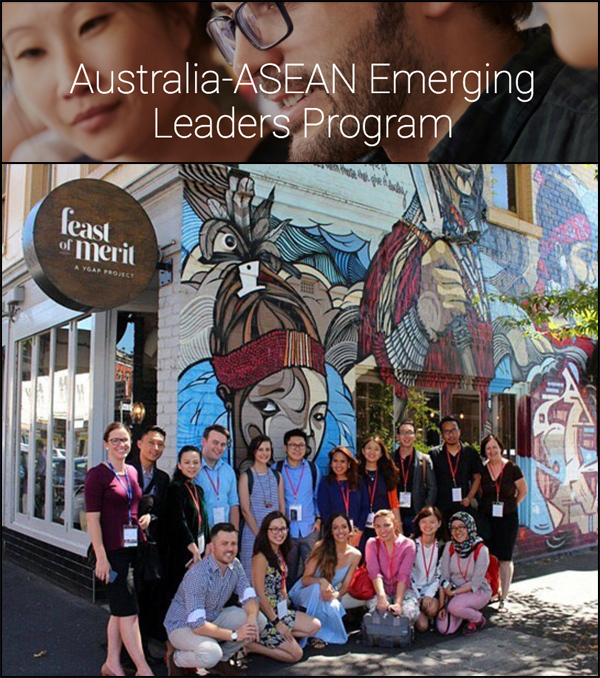 from RMIT University Melbourne and BA of Music (Composition & Production) from the Australian Institute of Music Sydney. Sandy’s creative practice usually involves electro-acoustic instrumentations and manipulating found sounds. 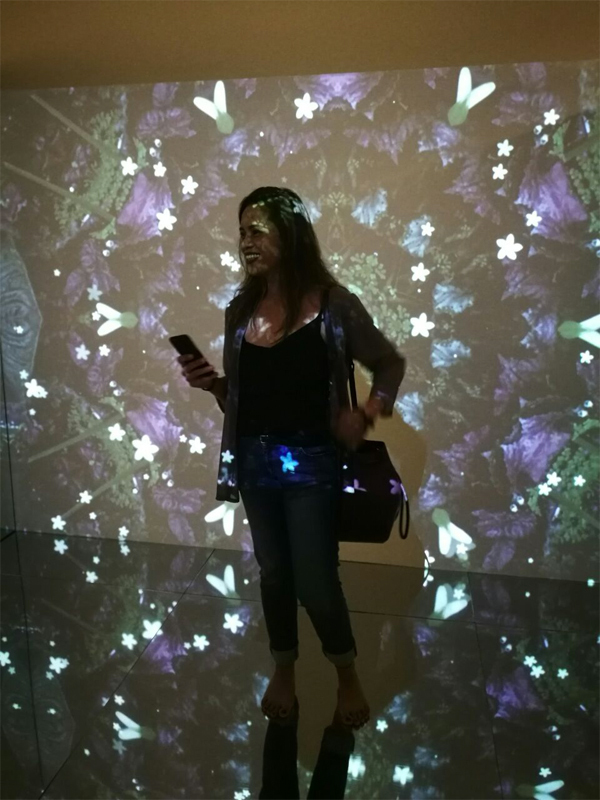 Her work is inspired by a curiosity for how sound and music influence our social experiences, as well as parallels drawn between sound and other art forms. Sandy has learned that anyone can create and showcase art. Talent is made valid with practice. For updates, you can follow @soundncanvas on Instagram. 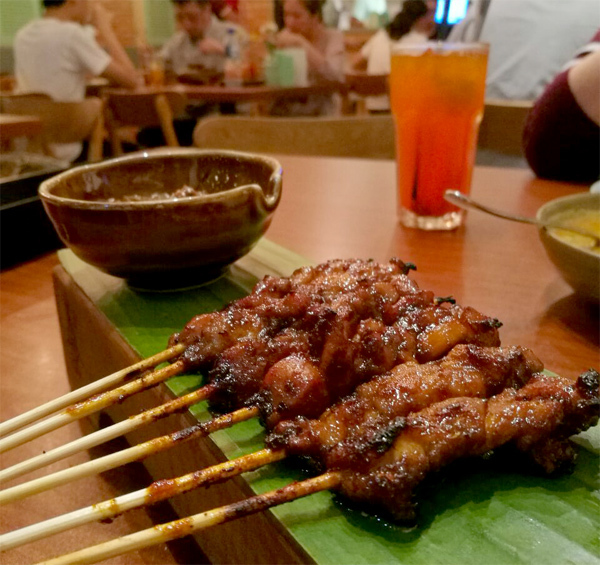 Who says that Brunei has nothing to offer especially during the holiday period? 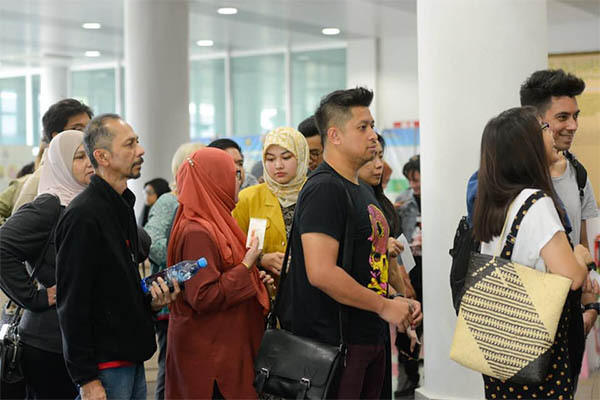 According to Yang Mulia Awang Wardi bin Hj Mohammad Ali, Deputy Permanent Secretary (Tourism), Ministry of Primary Resources and Tourism, there are plenty of events to look forward to and not necessarily those who are traveling during the holidays will be away for the whole of December. 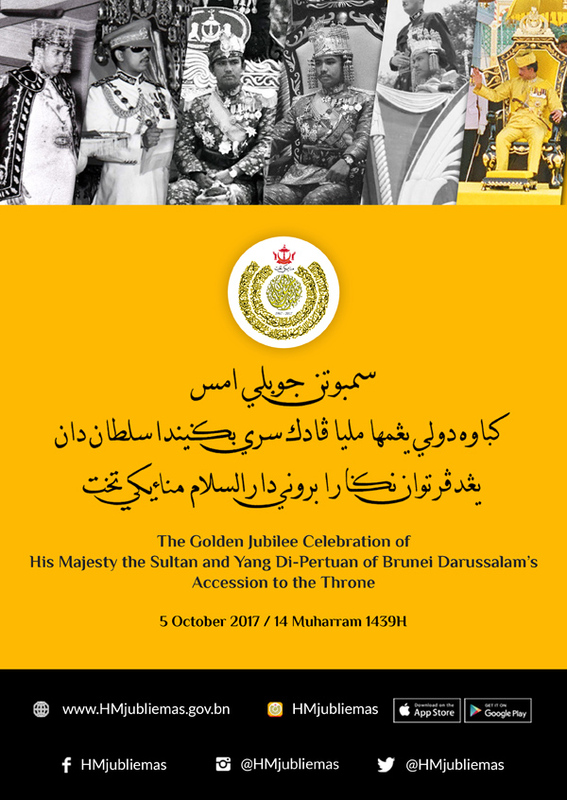 Hence there are enough activities for the residents of Brunei Darussalam to enjoy from late November to December 2017. 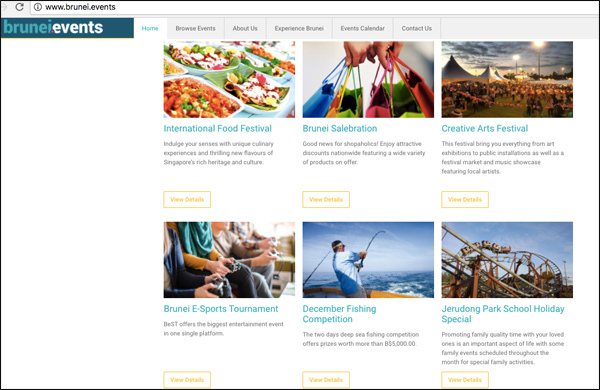 Yesterday marked the launch of the www.brunei.events, a portal and application for tourism services for the general public as well as incoming tourists to be aware of any events in Brunei Darussalam. 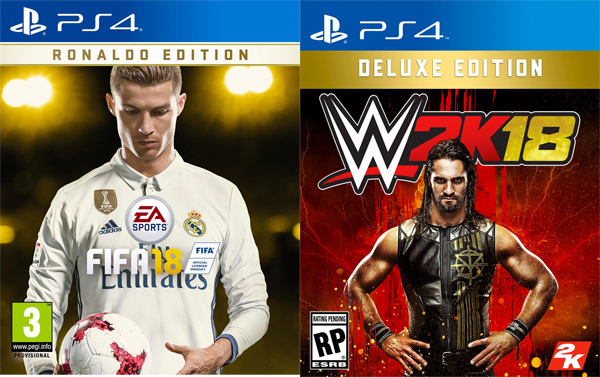 So what kind of events will be posted? There will be events such as roadshows, exhibitions, conferences, cultural activities, festivals and workshops. 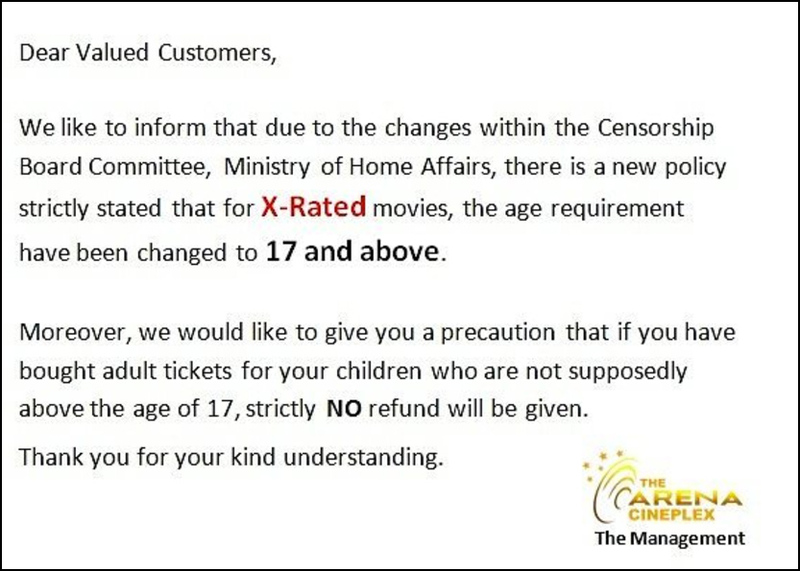 Just imagine it as the Time Out version of Brunei Darussalam. The portal which will be available soon for mobile apps is a collaboration with Brunei Tourism Board, Progresif Cellular and Mixmediaworx. 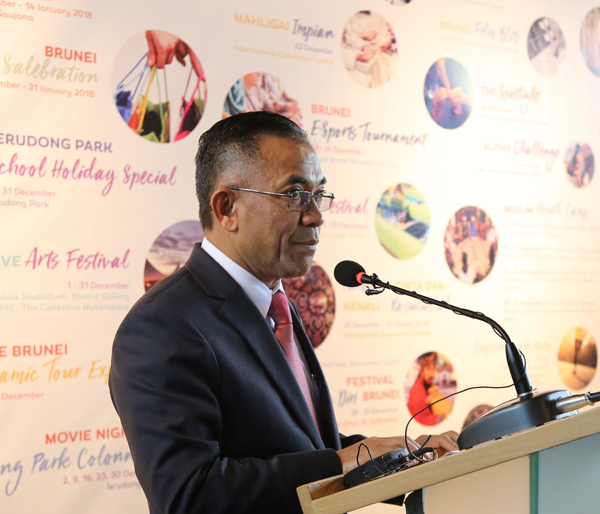 The official launch took place at the Tourism Information Centre, Galeri Sini at the Royal Wharf and it was graced by Yang Berhormat Dato Seri Setia Awang Haji Ali bin Haji Apong, the Minister of Primary Resources and Tourism. 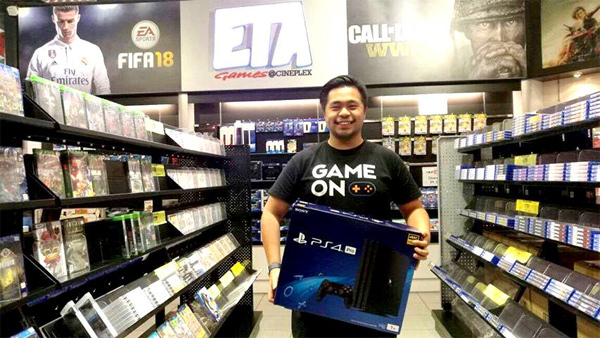 Some of the main events lined up for December includes Brunei Film Blitz, Brunei E-Sports Tournament, Muslim Youth Camp, The Alpha Race, The Autofest, The Superwoman Run, Spotlight finals, Larian Festival Seni Belia Diri 2017, International Food Fair and not to forget the Bandarkuceria in all districts. 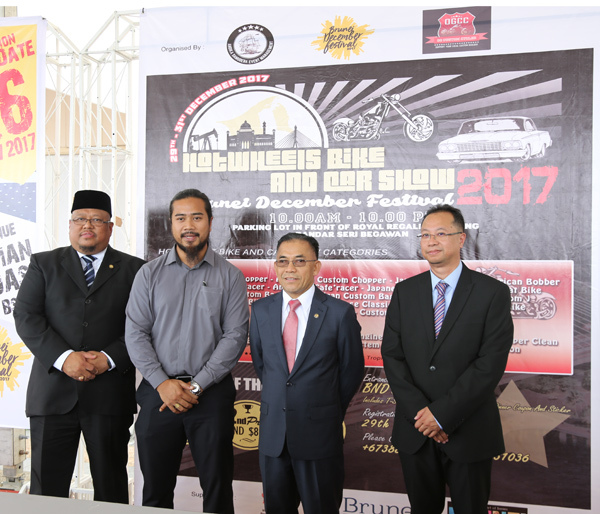 Wardi highlighted that this will be a yearly calendar for the upcoming Brunei December Festival. 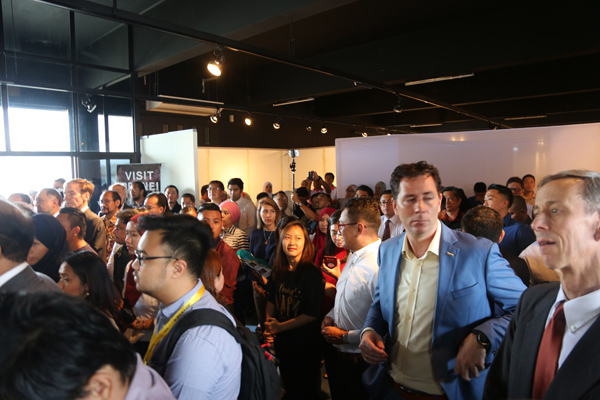 He hopes the objective of this event is to spur the growth of international tourist arrivals to Brunei Darussalam and also by having a yearly event, this will hope for a repeat participation from current vendors. 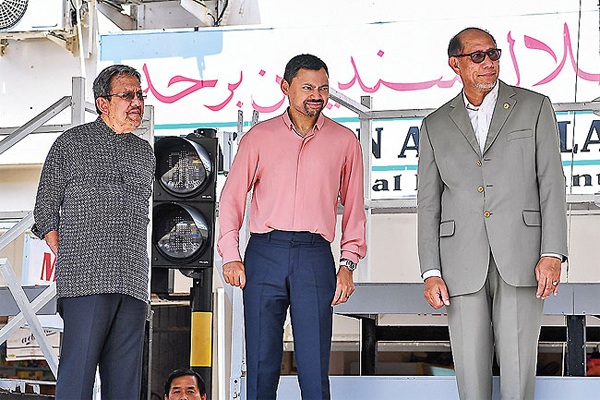 Having these events in Brunei will also help to stimulate the domestic growth within the economy. 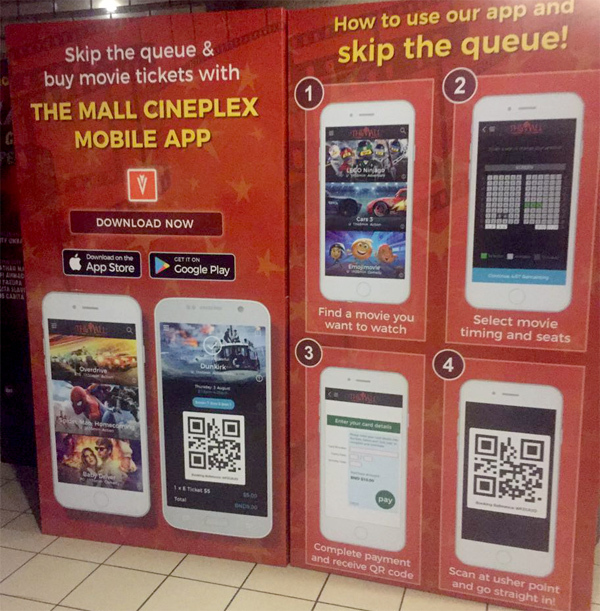 How the portal looks like. Click image to find out more. Sometimes I am amazed that we do have what it takes to be talented artist. But we also need to have that perseverance, hard work and dedication to make it successful. 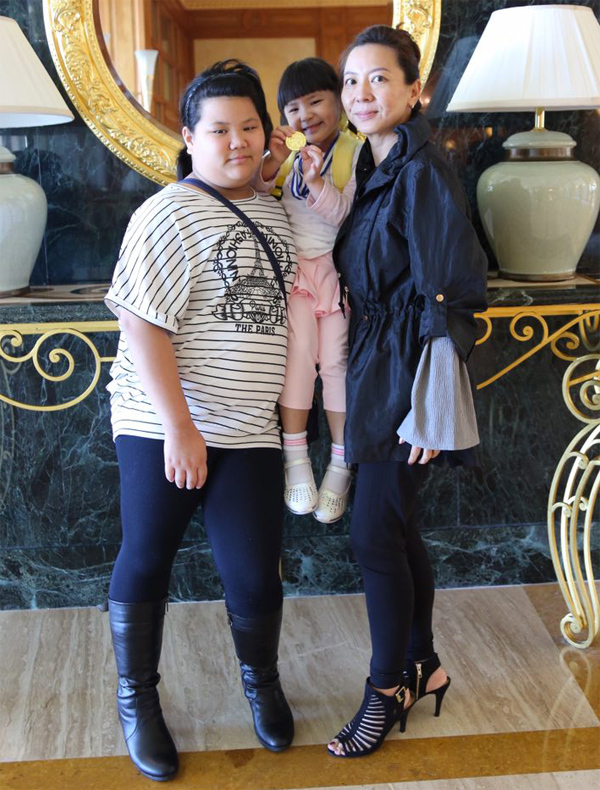 It’s never easy especially when you have to juggle with education, a high school graduate from Jerudong International School. 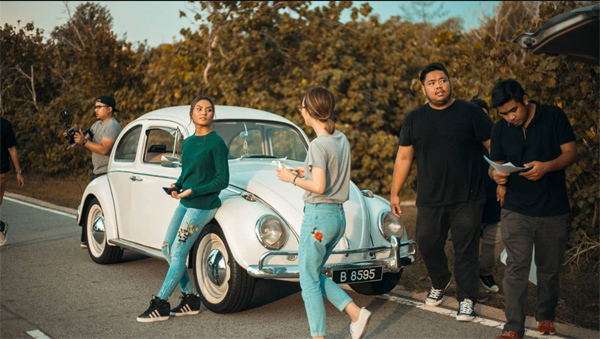 A very humble person, it’s no surprise that Aziz Harun has made it a name for himself in Brunei and yes, he is only 18 (now you can drive, bro). I wished I am still around that age because it’s always great to feel youthful. 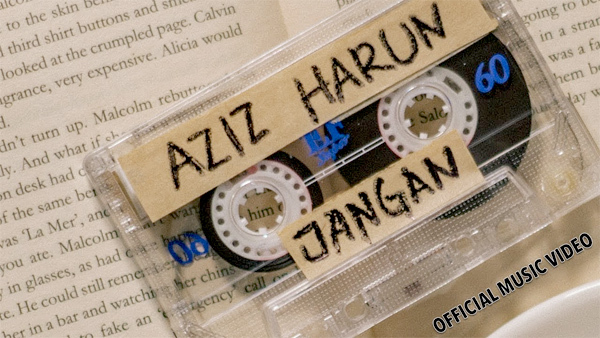 Aziz Harun’s latest single, “Jangan”, has been released successfully on iTunes and also the launched of the official music video produced by Bahzi Damit @beedee.creative. So far the music video has garnered around 40,000 views in just two days into the release and now has hit over 120,000 views. Amazing!! 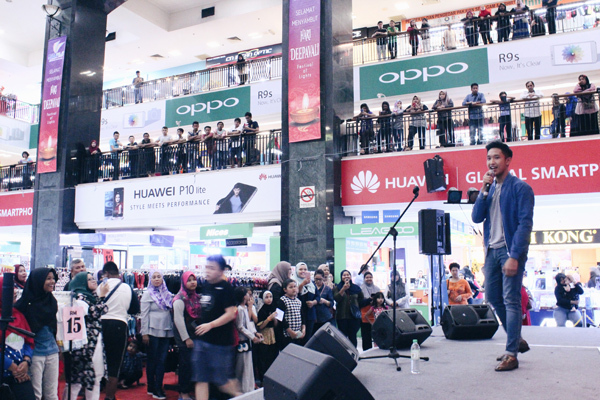 Aziz Harun’s first single, “Senyum”, did break the milestone in terms of views on youtube (over 2 million views). Let’s see if he’s able to break his record. 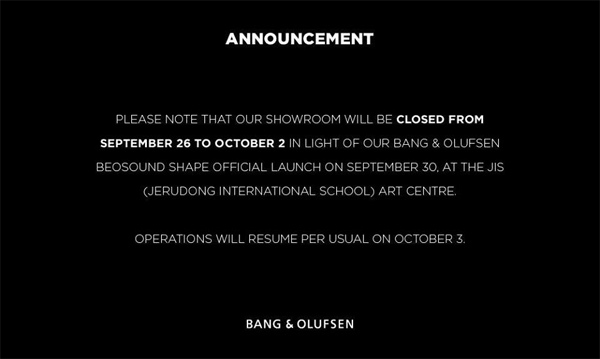 The sneak preview of “Jangan” took place at Bang & Olufsen signature store at Sejalin Living last Wednesday, attended by Aziz Harun’s family and friends and of course, the social influencers. Sorry that I wasn’t able to attend your mini gig then. 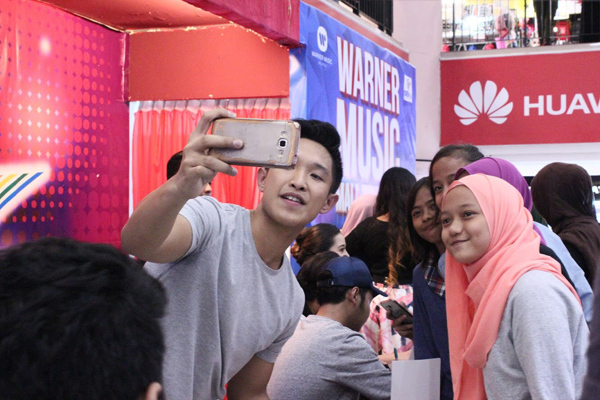 Aziz Harun is currently in Malaysia for a mini tour to promote his latest single “Jangan” as he has been making appearances at malls within cities and also at university along with Warner Music artists. So far, the responses have been encouraging and overwhelming as the fans were singing along the chorus when Aziz performed. 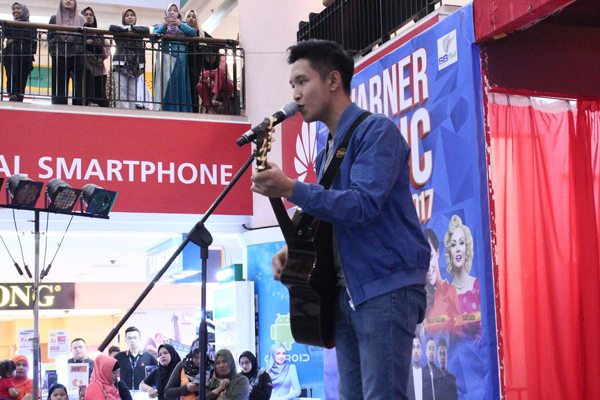 As he mentioned, he will be taking a gap year to gain experience outside Brunei and performing more live gigs in Malaysia. At the same time, he wants to learn to compose and write song as well as writing for others. 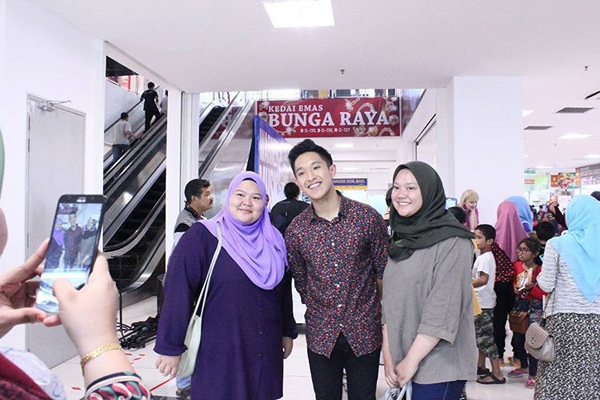 He is very grateful that his latest single hit the top chart in Brunei’s iTunes and it will motivate him to constantly work hard and make new music. 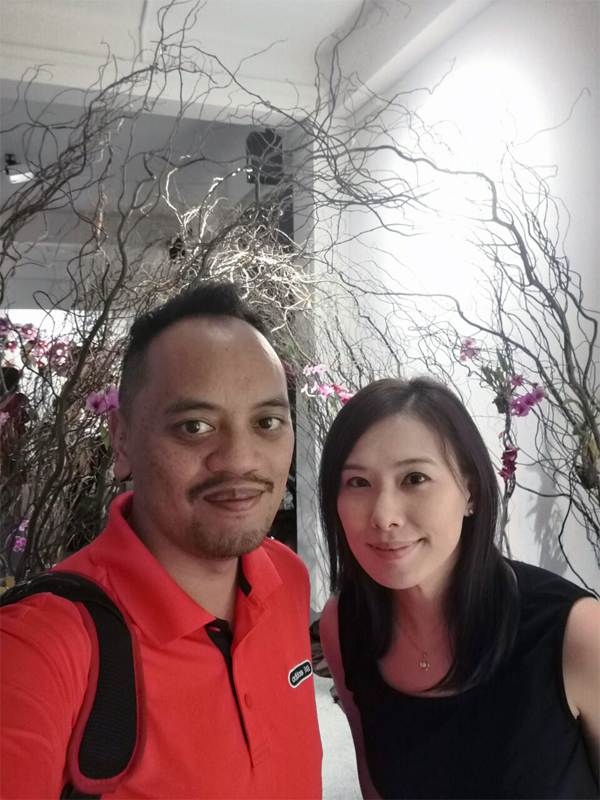 Aziz Harun is now being managed by his sister Molly Harun while his previous manager, Bahzi Damit, has focused more on producing videos. 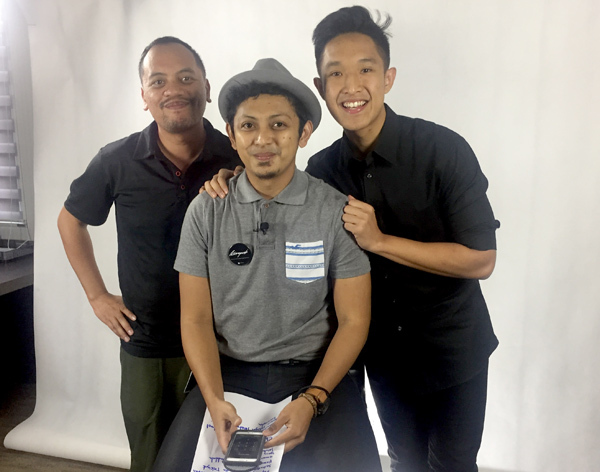 The latest music video “Jangan” was produced by Bahzi’s company @beedee.creative. 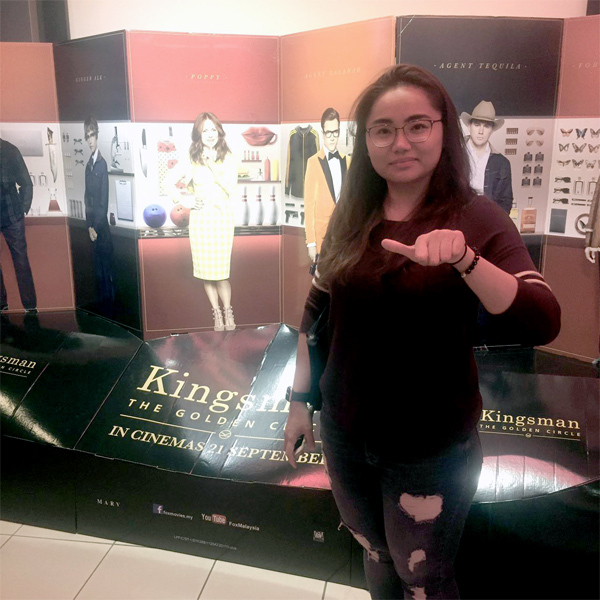 All the scenes were shot in Brunei. The pre-production took 3 weeks while the shooting lasted 3 days with one week of editing. According to Bahzi, this is the second music video that was shot in Brunei after his previous single, “Mama”. For Bahzi, the music video was more of a social experiment kind of video and he hinted that there was a story for which you will need to watch to understand. 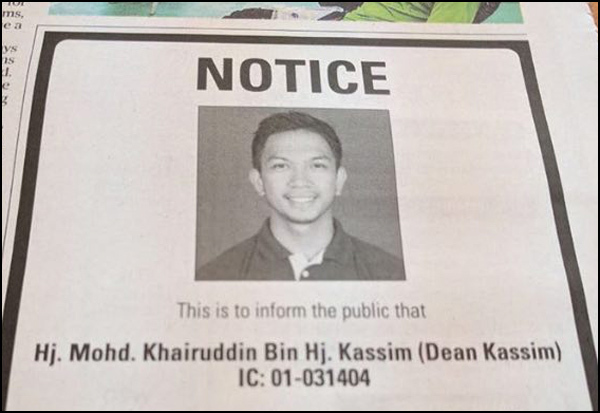 Once again, good luck to Aziz Harun on his latest venture and hopefully you will gain more exposure and success. 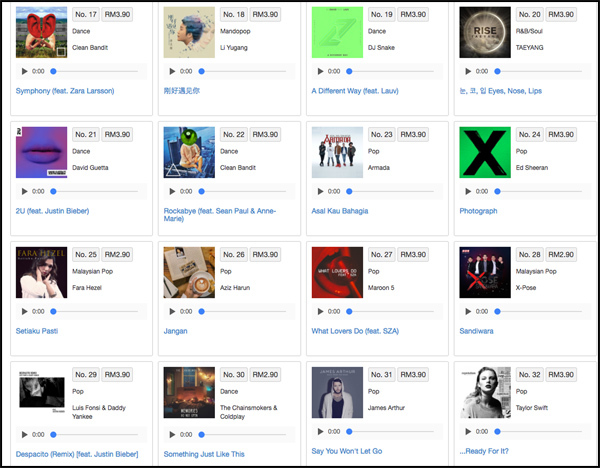 A strong presence in the Malaysian charts, jumping to No.26 from a debut number 46. 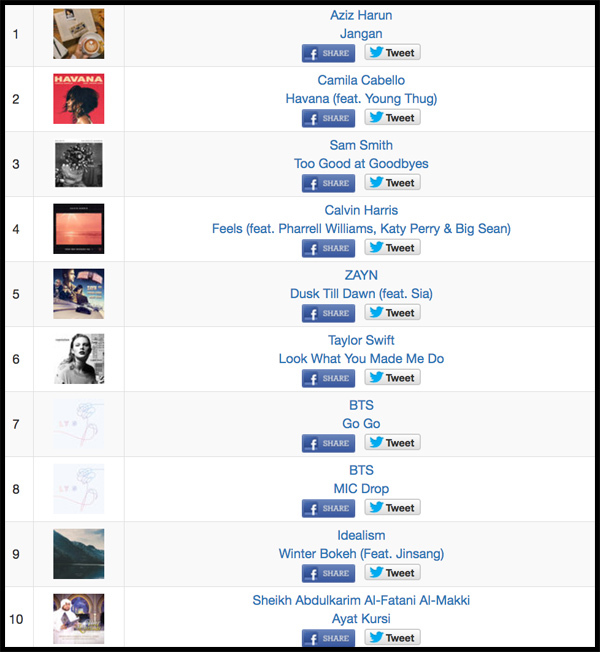 Let’s hope it keeps rising to the Top 10. 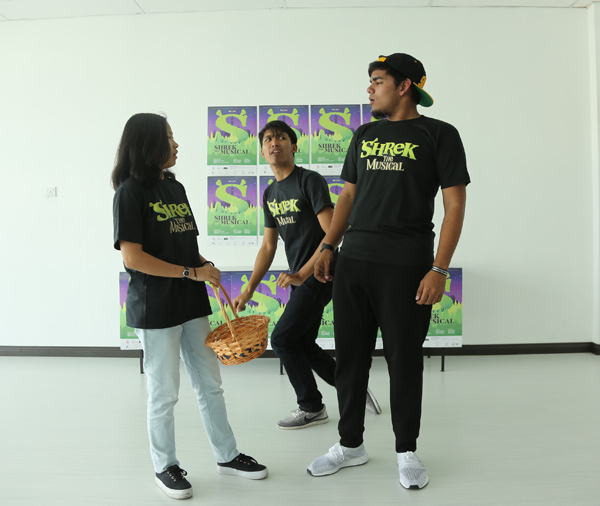 Relentless Entertainment Brunei will be holding their fifth (5th ) musical production, ‘Shrek’ The Musical. The exciting two and a half hour show is set in a mythical ‘once upon a time’ sort of land featuring Shrek, a hulking green ogre who, after being mocked and feared his entire life retreats to a swamp to exist in happy isolation. Suddenly, a gang of homeless fairy-tale creatures (Pinocchio, The Three Bears, Ugly Duckling, Big Bad Wolf, etc.) raid his sanctuary, saying they’ve been evicted by vertically challenged Lord Farquaad. Shrek goes on a journey to get his swamp back and is given a deal to rescue Princess Fiona for his swamp back. 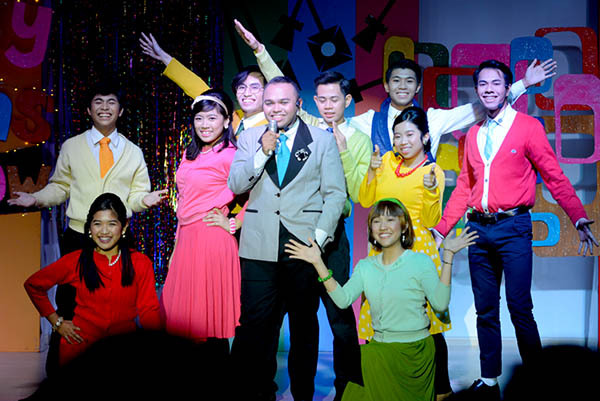 The musical is supported by the Ministry of Primary Resources and Tourism, Brunei Tourism Board, Progresif Cellular Sdn. Bhd. , YippyTune Music School as official Vocal Coach, The Faceshop as the official make up sponsor, Dragons and Pixie Dust and Karen Then Make Up as Official Special Effects Make Up Artists, Offset Printing House as the official Print Partner and ticketing partners R&C Café and The Coffeebean & Tea Leaf. 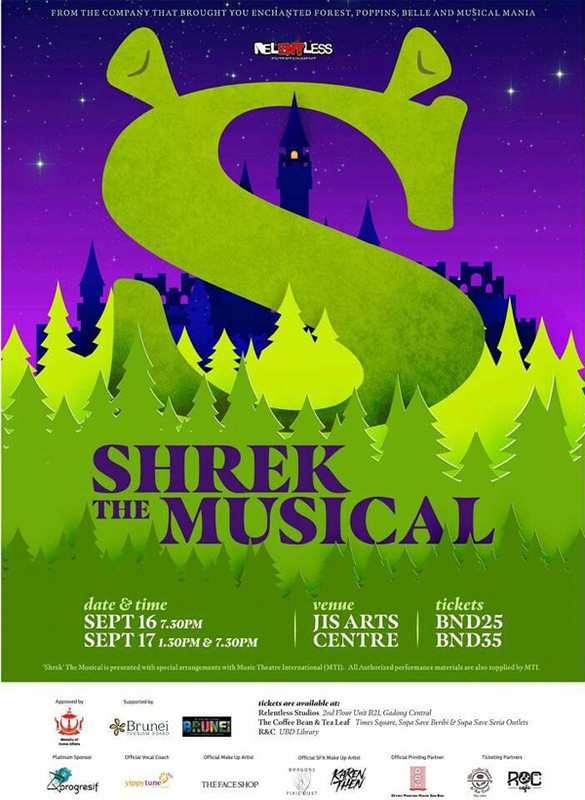 With a total of 50 talented local cast members of different age groups performing, Shrek The Musical promises to be a fun, entertaining and colourful family event. 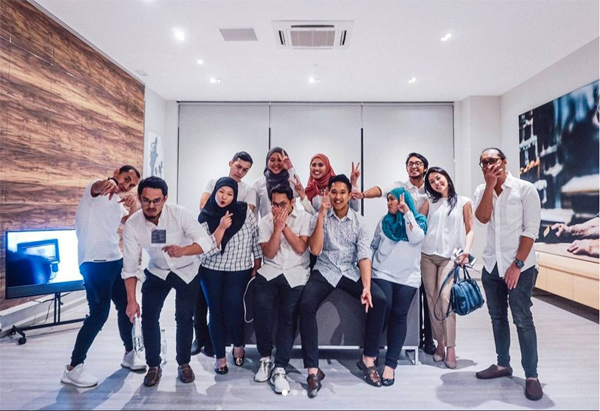 For the past 10 years Relentless Entertainment, a local performing arts, education and events management company has worked closely with local talents and artists and hopes to develop as well as establish a vibrant creative industry for the vast amounts of talents in Brunei. This will be the first time they are organizing two (2) musicals in a year. Earlier this they produced Musical Mania, which they also announced, will be a yearly event. 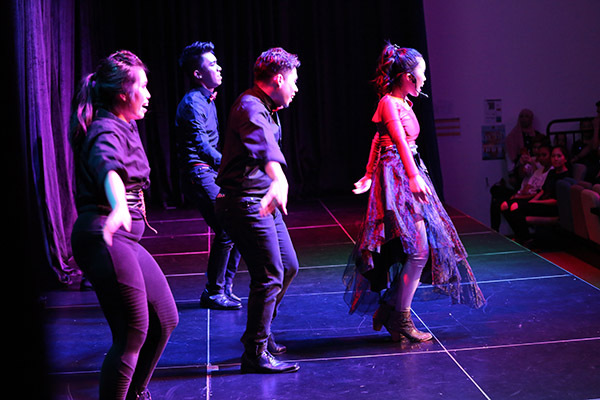 Producing and organizing theatre musicals is the company’s way of providing the many aspiring local actors, singers and dancers a platform to perform and showcase their talents, to give all stage crew members the experience of working behind the scenes on a musical production and to show that Brunei / Bruneians are capable of producing musical shows of high standard with local talents. Relentless believes that a musical production is a positive event and will have a positive impact on the community and all involved. 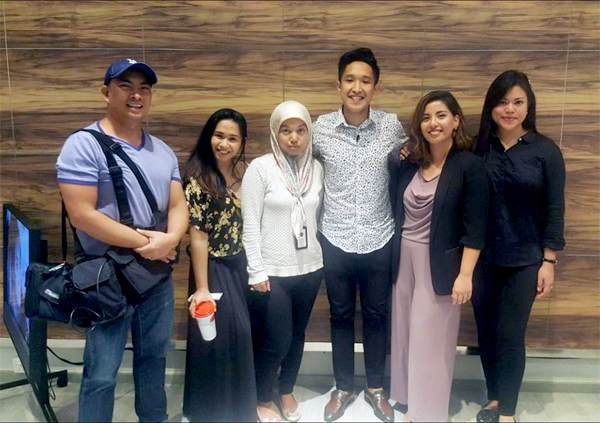 The cast and crew are excited about the opportunity to contribute to the growing performing arts industry in Brunei Darussalam. 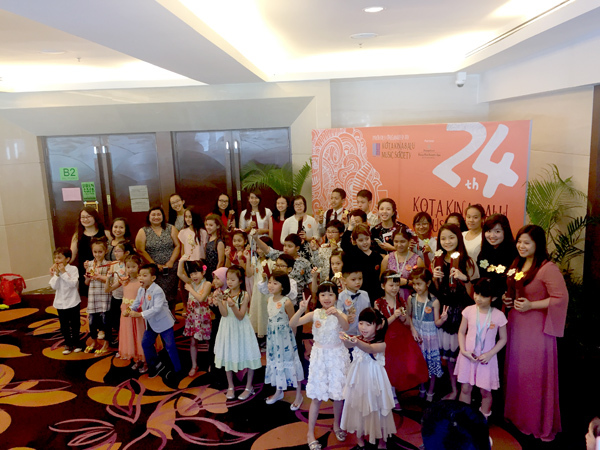 A total of 52 students from Yippy Tune Music School participated in the 24th KK Music and Dance Festival in the Shangri-La Rasa Ria Resort on the 1st & 2nd September in Kota Kinabalu. 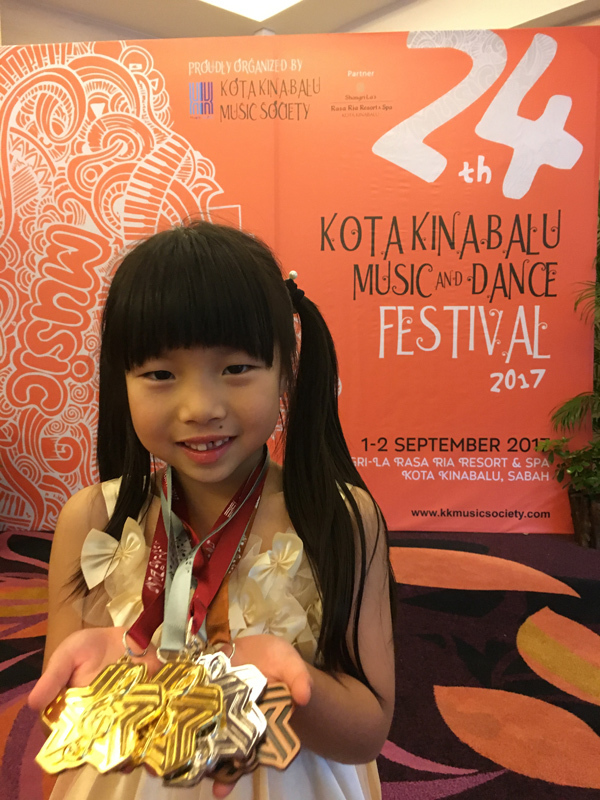 This year, the event saw a record participation of 1,600 musicians from Brunei, Singapore and Malaysia. 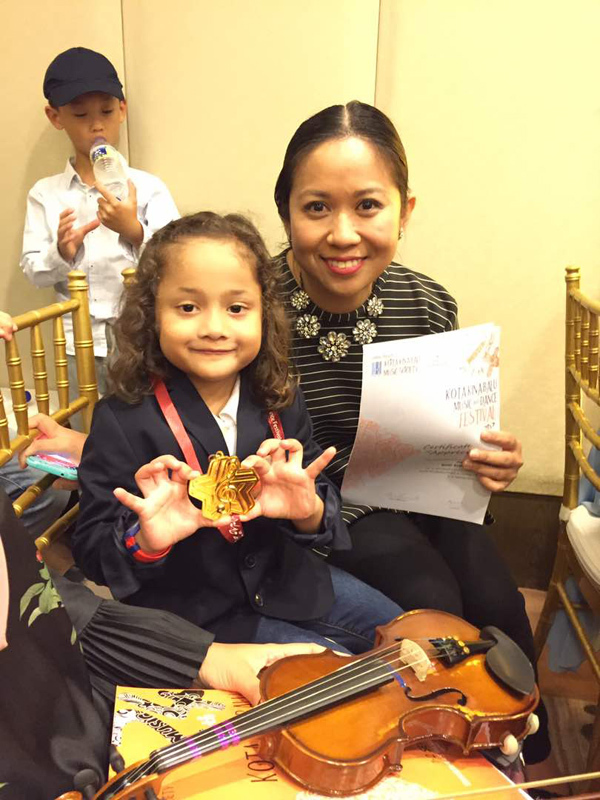 The participants from Yippy Tune competed in the category of piano, vocal, violin and drums and pocketed a total of 90 medals, which consists of 26 Gold, 41 Silver and 23 Bronze. 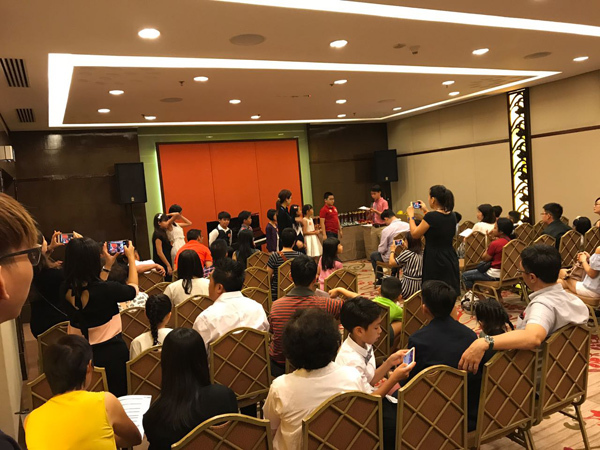 Some of the students who attained outstanding results include Siena Hoon, 5 Medals (2 Gold, 2 Silver and 1 Bronze), Freda Ngu (2 Gold, 1 Silver), Ethan Officer and Jonathan Foo (2 Gold each). 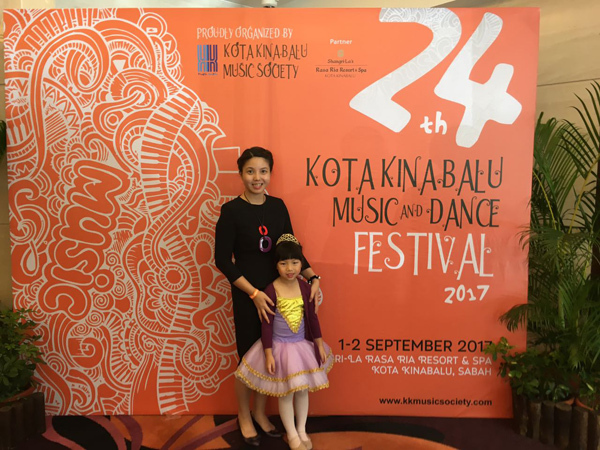 According to a parent, “The KK Music Festival created an incredibly inspiring and unique experience where my child can perform in front of an international crowd. 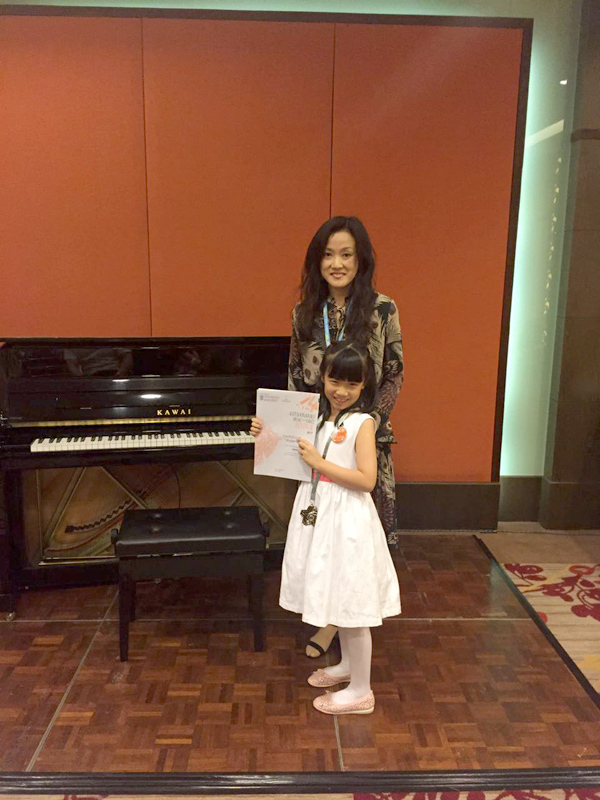 It really humbles you to see so many talented individuals and at the same time lift everyone’s standard because of the friendly competition.” Said Delon Hon, whose daughter, Natalie received a Gold Medal in her Piano Performance. 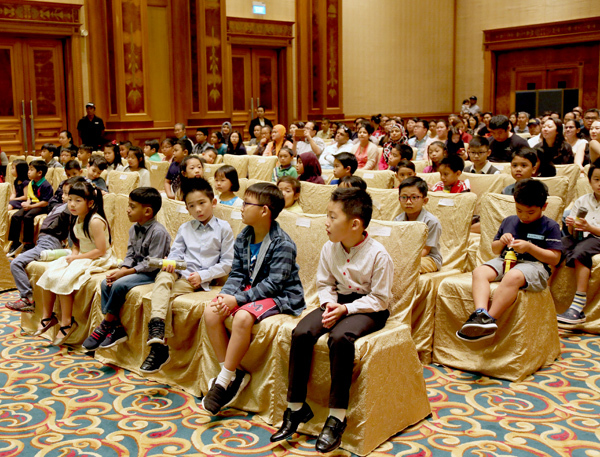 The music gathering this year was a much-anticipated event especially because the organisers stepped up the game by inviting world-class performers and judges to take part in the judging panel and conducted special group classes for the students. 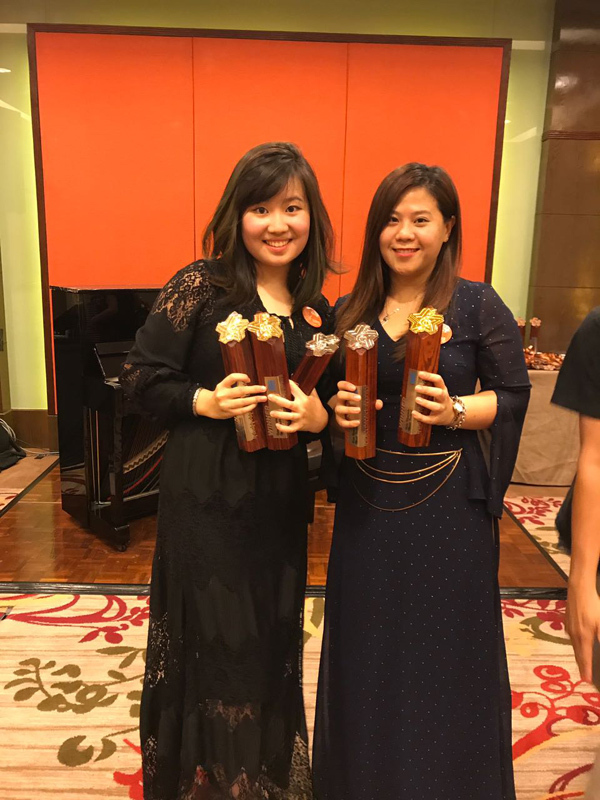 Renown participants included Pianist, Yen-Lin Goh whose work appeared in Vera Ivanova’s soundtrack, Wesley Johnson, a senior lecturer from UPSI, Dr. Tham Horng Kent, the recipients of Asia Yamaha Music Scholarship graduated from Royal Conservatoire of Scotland and Japanese pianist Misa Yamamoto. 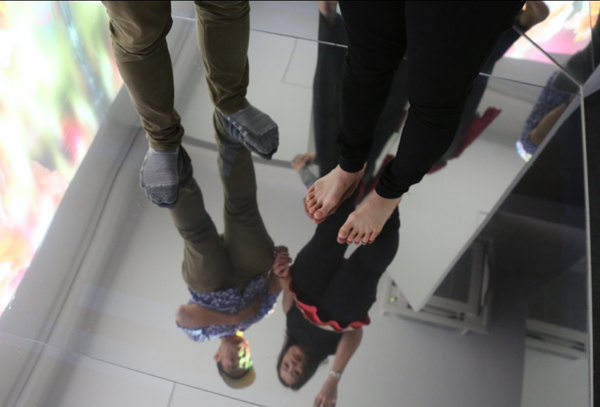 Press release and images courtesy of Yippy Tune.